Avercamp is famous for his lively winter landscapes. As a child, he often went skating with his parents. 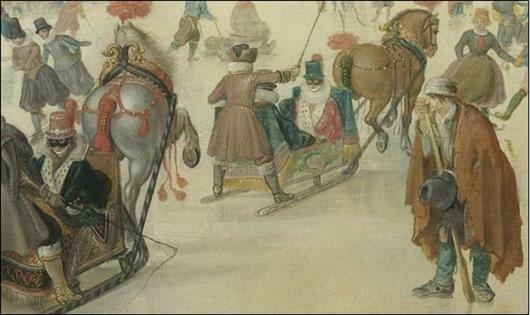 The late 16th century, the coldest period of the so-called "little ice age", gave plenty of opportunity. Young Hendrick clearly loved the fairy-tale atmosphere of winter. Being deaf-and-dumb, and therefore more isolated in his own world, he must have been keen to keep and apply these happy youth memories in his later work. Also an excellent observer, he became a master in capturing the fragile winter light. 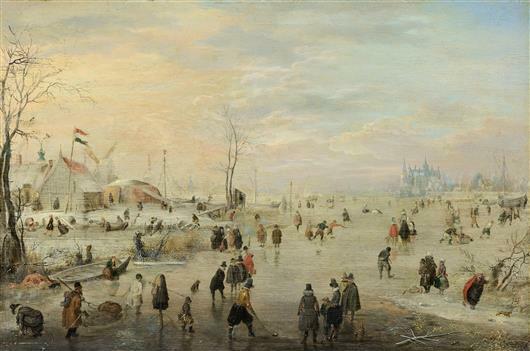 Hendrick Avercamp, was born 1585 in Amsterdam, next to the Nieuwe Kerk (New Church). When he was one year old, the family moved to the northern town of Kampen where his father started a pharmacy. The family valued a good education, but for "poor Hendrick" with his handicap, drawing and painting proved a better form of expression. At the age of 18 he went to Amsterdam for further artistic training. There he met several Flemish painters, refugees from the war in the southern Netherlands, who were going to have an important influence on content and style of young Avercamps' work. After about 10 years working and studying in Amsterdam, he returned to Kampen and his family, where he stayed until his dead in 1634 at the age of 49. Avercamp also used paper and water-colour. Like for the three next works. More rapidly produced and cheaper. Being very popular for collectors albums, these images swiftly found their way throughout Europe. Above left : country folks on the ice with a cargo sledge, possibly making their way to the market. On the background the gallows, a repeating element with Avercamp. 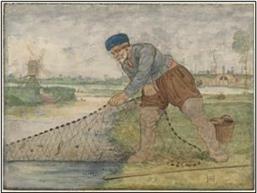 Full size : Rijksmuseum object RP-T-1899-A-4198 Above right : a fisherman hauling in his net. Avercamps' work is often very documentary and relevant for studying 17th century daily life. 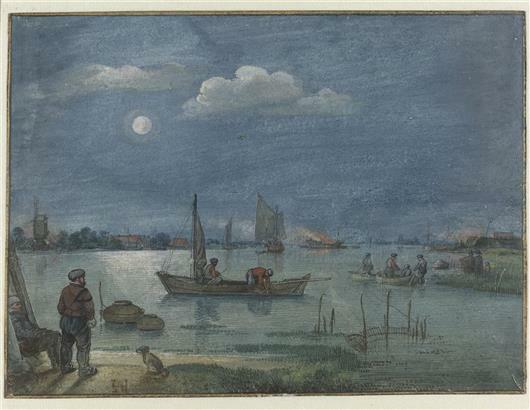 Full size : Rijksmuseum object RP-T-1919-29 Above : fishermen on the river by moonlight. Ful size : Rijksmuseum object RP-T-1948-397 Below details of other Avercamp winter paintings in the Rijksmuseum Amsterdam. 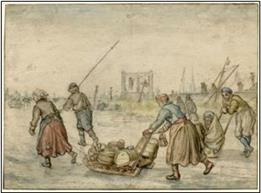 The Rijksmuseum Avercamp webgallery allows to view it all in high resolution, so you can zoom in for the great details.